The boy had a birthday party for one of his friends yesterday over in Manitou Springs. 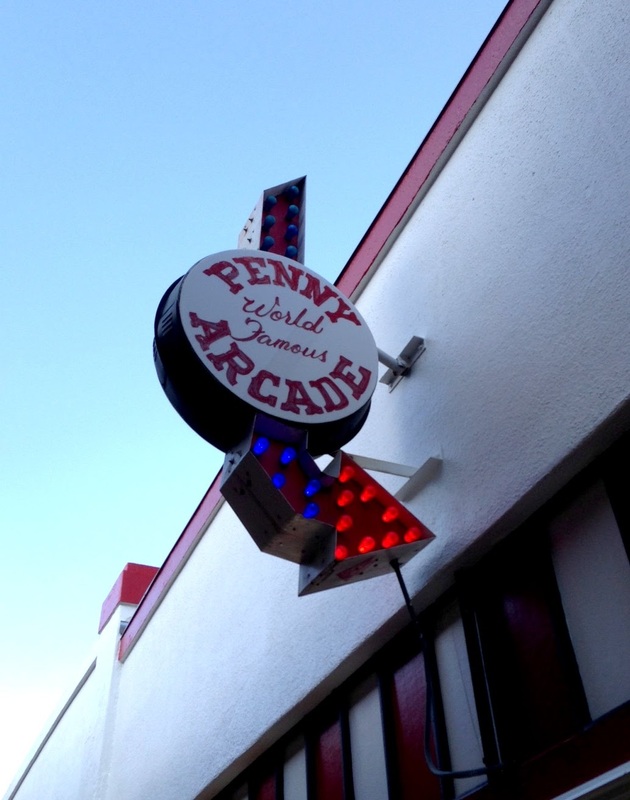 We met up for pizza and cake at Soda Springs park, then headed over to play games at the Penny Arcade. 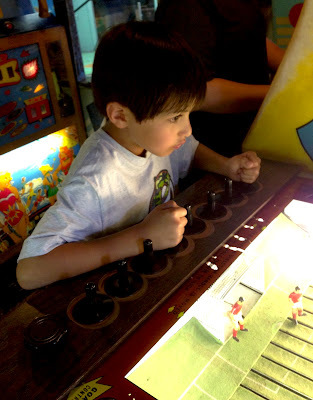 For as much as we love Manitou, I hadn't really discovered the arcade before, and it really was the perfect little boy birthday party! The Penny Arcade is tucked away in downtown Manitou Springs, in a little alley with storefronts that joins the two sides of the main street (east and westbound). 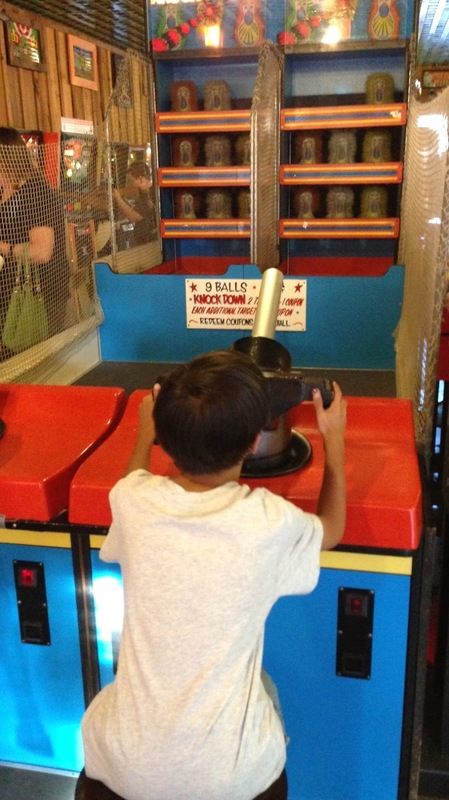 Since it is not an actual street, it was great for the boys to be able to walk to the different areas--Skeeball, the rolling RaceHorses, contemporary games, and the classic ones at the Penny Arcade. There were also outside consoles and assorted ride-ons for the little ones. Ben and his friend checked out several of the areas, but the one labeled Penny Arcade really caught their eye. 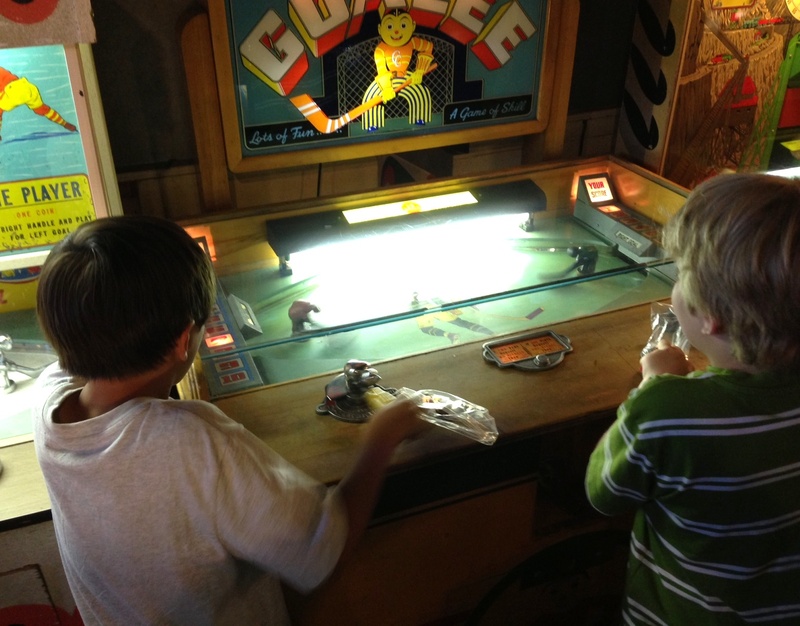 It was filled with old fashioned games, all still with the original pricing, so they were able to play games for nickels and dimes as well as the standard quarters. Ben trying a very old "football" game! 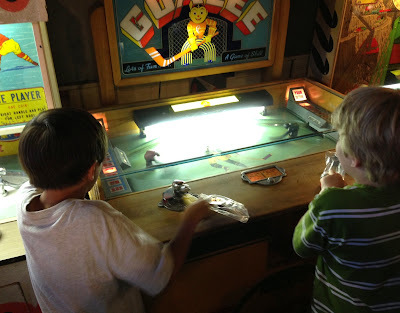 The boys tried out a ton of the old sports games--hockey, football (or per Ben "This is soccer, Mama"), along with pinball machines, a crane game that they absolutely adored that involved scooping gravel, and a shooter game where they tried to knock down monkeys while firing balls at them. 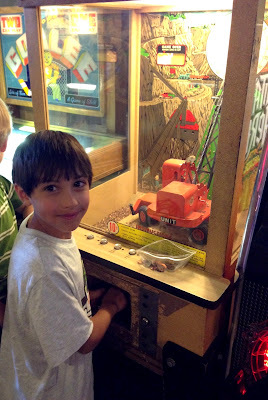 The boys also played a few games for tickets, and Ben's friend hit the jackpot on one, earning over 100 of them. Ben was more interested in the non-ticket games, so he came out with 15. We stopped at the prize area on the way out and Ben got a pack of chocolate covered raisins which made him quite happy. His friend got a kazoo, which I'm sure was less than thrilling for his parents. The crane game, Ben's favorite! It was awesome to see how much they enjoyed the older games that weren't so screen related! Ben has decided that we absolutely must take Daddy and Faith with us the next time so they can play more games, and since I love Manitou, I can see that being a plan!